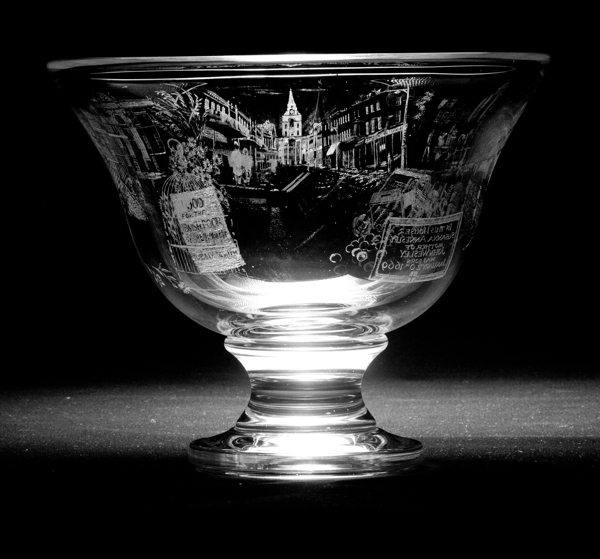 One of these streets’ most-esteemed long-term residents summoned me to view an artefact that – until today – few have seen, the fabled Spitalfields Bowl. 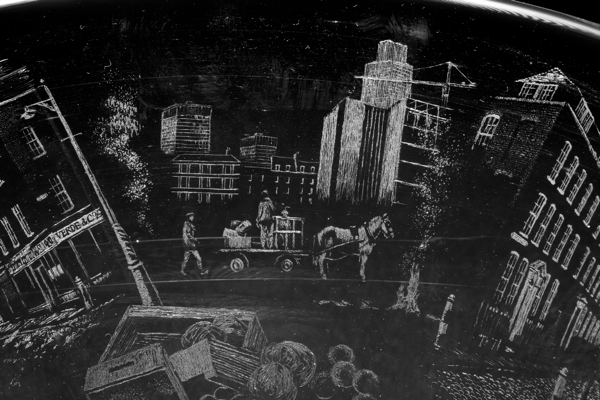 Engraved by Nicholas Anderson, a pupil of the great master of the art, Laurence Whistler, it incarnates a certain moment of transition in the volatile history of this place. 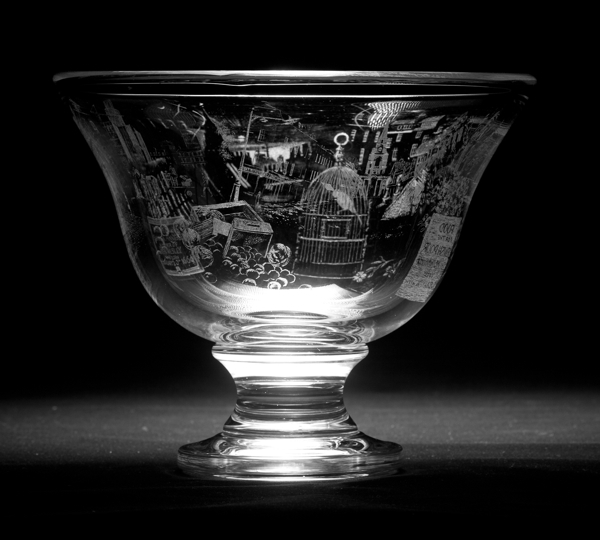 I arrived at the old house and was escorted by the owner to an upper floor, and through several doors, to arrive in the room where the precious bowl is kept upon its own circular table that revolves with a smooth mechanism, thus avoiding any necessity to touch the glass. 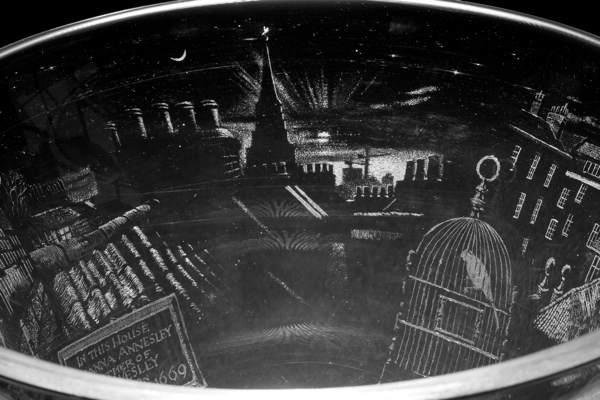 Of substantial design, it is a wide vessel upon a pedestal engraved with scenes that merge and combine in curious ways. 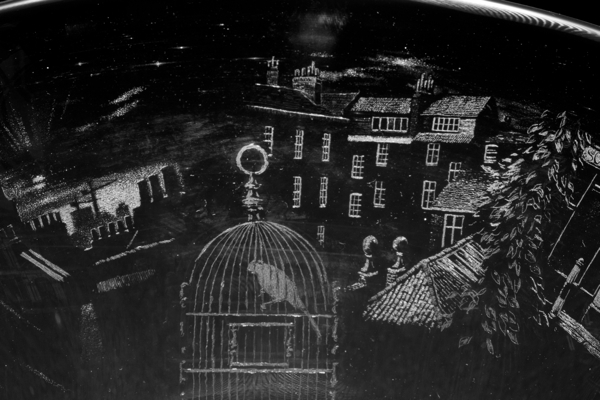 You have the option of looking down upon the painstakingly-etched vignettes and keeping them separate them in your vision, or you can peer through, seeing one design behind the other, morphing and mutating in ambiguous space as the bowl rotates – like overlaid impressions of memory or the fleeting images of a dream. There is a mesmerising quality to Nicholas Anderson’s intricate design that plays upon your perception, offering insubstantial apparitions glimpsed in moonlight, simultaneously ephemeral and eternal, haunting the mind. 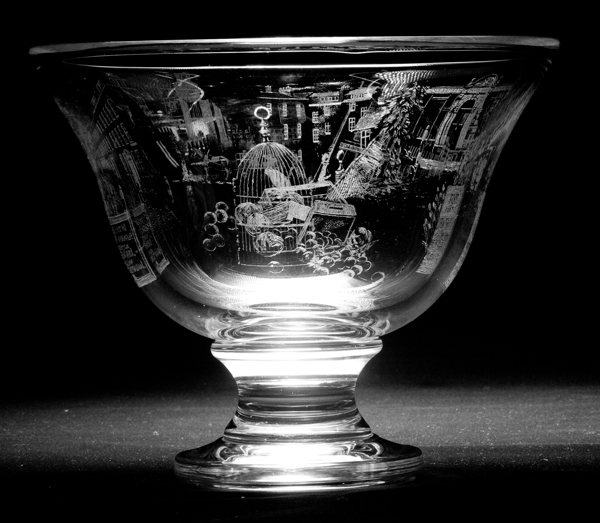 You realise an object as perilously fragile as an engraved glass bowl makes an ideal device to commemorate a transitory moment. 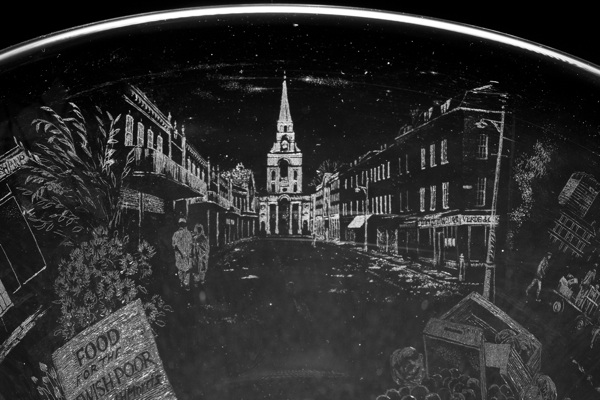 Sequestered in a locked room, away from the human eye, the Spitalfields Bowl is a spell-binding receptacle of time and memory. To the left is Elder St and the plaque commemorating the birth of John Wesley’s mother is in Spital Sq. What a breath-taking piece of art and craftsmanship. I can’t begin to conceive how such panoramas could be fitted into this small space. 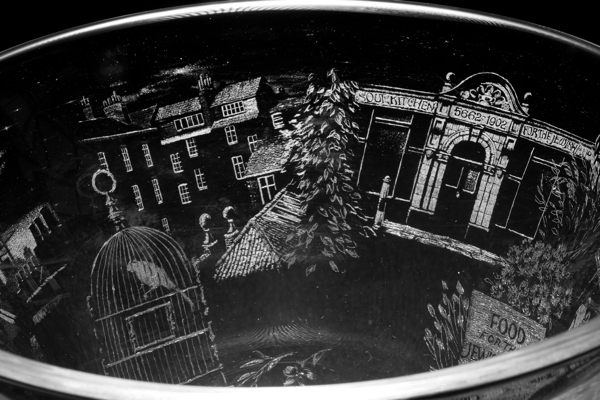 What a wonderful bowl and a fantastic story. Thank you. Absolutely exquisite! It must be stunning to see such a work of art. Would be great to see it “In the flesh” ! 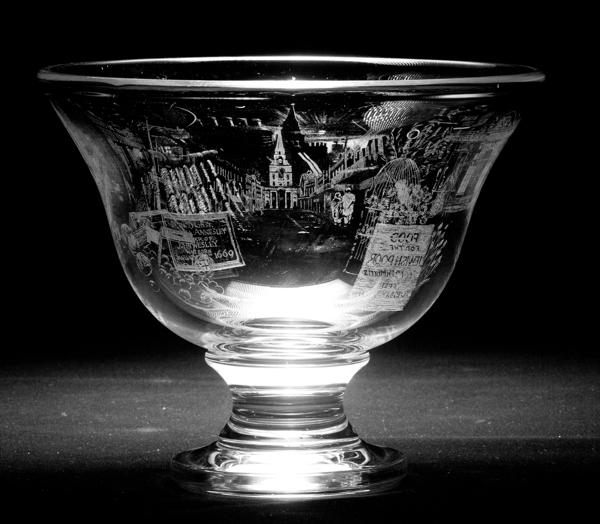 Would it ever be put on display for the public? This is fantastic. I suspect that the views of it are enhanced by the way it is lit but, even accounting for that, it is wonderful. 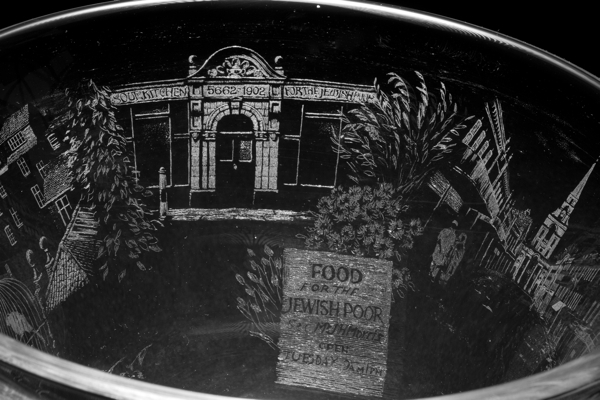 I dont think I have ever seen a bowl with such intricate and artistic etching. What a delicate work of art. Whoever owns it must love it deeply. Perhaps one day they will display it for the community to see. 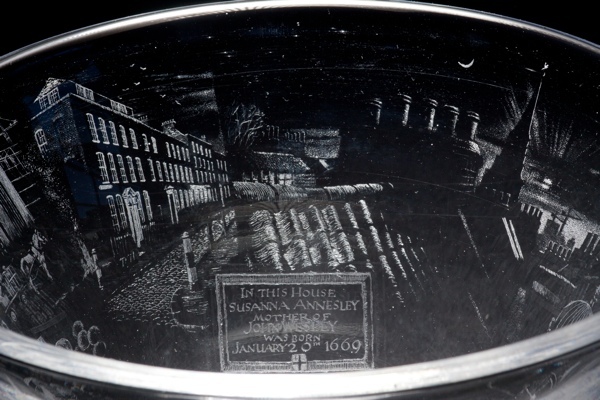 A beautiful piece of glass and a wonderful story. 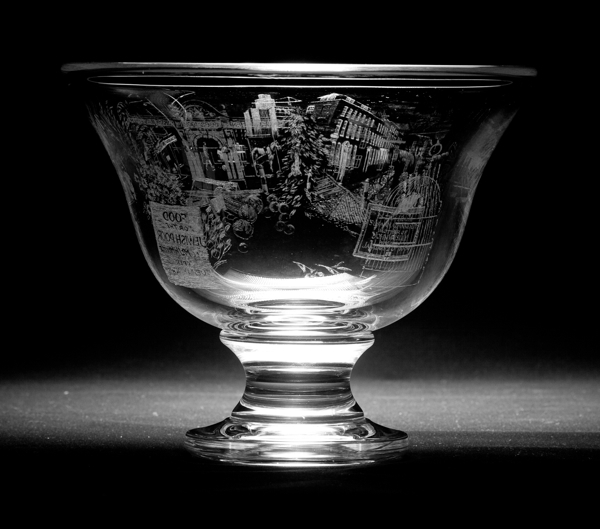 This Bowl is So Beautiful-What a Lovely Christmas Gift it would make! Yes this is a truly beautiful piece of work but how sad that it is kept locked away like this I apologize for my feelings but I think that the artist deserves better. I keep marveling at how you, Gentle Author, have captured and enriched Spitalfields and opened it wide for all to explore without intruding… and now here is this incredible piece of art, clearly commissioned by one who loves Spitalfields as much as you do. Did you ever dream, when you started your journal, what an important and valuable part you would play in the history of London? Thank you again from an avid reader across the pond. This blog works so well because you write so extremely well — plus good research — so please keep it up. What a fascinating piece. Once again, thanks for bringing us something I’m sure very few of us knew existed. I am absolutely speechless!! Utterly and Totally Awestruck!! Thank you so much for showing us this unique piece of art/history. I regularly read your blogs and share your photos and history on East End Memories (always naming my source and showing the links should there be so much to be shared)!! Amazing work. I take my hat off to you sir. Keep this great work up . Merry Christmas and Happy, Healthy, Serene and Peaceful 2018 to you and yours!! !